Let's talk MAGTEC. What is magnetic coupling, anyway? And when should you choose magnetically-coupled cylinders, as opposed to another style? One reason pneumatic cylinders are so versatile is that they can be configured in so many different ways. That makes it easier to find a great match for your specific application, but it doesn’t mean every air cylinder works best in every instance. Most pneumatic actuators have a rod that attaches to the internal piston and protrudes through a sealed end cap. The rod and piston are powered by compressed air to move a load in one or both directions. In a rodless cylinder configuration, there is an external carriage that moves back and forth on the cylinder tube to activate the load. With a rodless magnetically-coupled actuator, the external carrier and the piston inside the tube are not physically attached. Instead, both components are fitted with strong rare earth magnets that couple them together. There are distinct advantages to this type of pneumatic cylinder for certain applications. W.C. Branham's MAGTEC® Rodless Magnetically-Coupled Cylinders are fully sealed, which eliminates potential lubricant leakage and prevents contaminants from getting inside. This enables the cylinder to perform reliably in an atmosphere where other types of products are more vulnerable. Without this added protection, components in difficult environments can suffer excessive wear and tear, requiring premature repair or replacement. 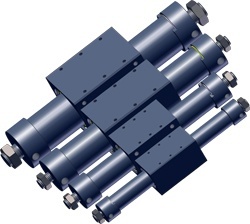 Rodless magnetically-coupled cylinders also offer design and cost efficiencies, saving both space and money by providing long stroke lengths at a lower cost per inch. They can move loads just a few inches, say on a piece of industrial equipment, or they can move heavy loads such as a car wash door 10 feet. When Should You Choose Magnetic Coupling? Their design makes these products ideal for working environments that are dirty, those that feature harsh temperatures and/or corrosive chemicals, and those that require frequent washdown. Good examples include food processing, where sanitation is critical and washdowns are aggressive, and car washes or similar installations, where doors see heavy use in all weather. Our DoorTec® Direct Drive Horizontal Operators are part of our line of rodless magnetically-coupled actuators. These products are specifically designed for use in car washes and other operations with heavy-duty doors that must open and close frequently. DoorTec operators can be purchased alone or in a bundled kit that includes an overhead horizontal mounting bracket and UL-approved, two-button pneumatic control box. The control box can be spec’d with an emergency open feature if desired. As always, we remind you that our design and engineering folks love a good challenge. Our mission here at W.C. Branham is creating “solutions in motion,” and that often means working with customers to modify one of our products or custom-design something entirely new. Perhaps an all stainless steel magnetically-coupled cylinder for your next wash down or ambient environment application?